This started out as a Bad Report Card entry but I received an email feedback from a person who used Angelo Mitchell's Village email address so I am going to create a separate page for recording this incident and the subsequent information that is being brought forth..
One of the in town businesses had taken a petition to be available to have their Amelia resident customers sign if they chose to do so. They were called by one of the collection supervisors and the supervisor was told that the petition had 4 signatures so far. The supervisor went up to the business the next day to get the petition and was told by the owner that a tall white haired man had come into the business and stated that the petition was invalid and that the man had taken the petition and left. The owner was asked who the man was and said they didn't know. The supervisor was very upset and reported it to one of the other leaders who called in the sheriff. The officer took a photo lineup to the "Business Owner" and she picked Angelo Mitchell out of the lineup. The authorities then made contact with Mitchell who did admit that he went to the business but that he didn't take a petition with signatures on it but did take a blank petition. Back to the business owner who then said that Mitchell may have taken a blank petition. When asked about the petition with the 4 signatures the owner said that it was probably lost during some changes they were making inside the building. This is a very serious matter and remains under investigation by the Clermont County Sheriff's Office. We will post any additional information as it becomes available. This is a clear case of intimidation. If I would tell you the name of the business you would understand why Mr. Mitchell would probably have no business going into this business and if I had to take a guess I would say he had never been there before! Council BETTER STOP THIS PRACTICE NOW!!! The above is the original report. The next segment is the email feedback I received on October 20th.. I don't know Laura Mitchell and I am not going to assume who she is. The email addresses on the Village website are open and available to anyone who goes to the website. Therefore to assume who this person is would be the wrong thing to do. If Laura Mitchell wants to send me a proper identification with an email address that belongs to her I would be willing to make an appropriate response. I want the truth! However, I believe what I posted to be absolutely true. Unless proven otherwise I stand by my posting. I will not repond to an unknown person who uses someone else's email adddress, who tells me I have a "HENCHWOMEN" who she does not identify and acts as if she were involved in the incident and is speaking for Councilman Mitchell and the Village. Send me credible proof instead of ranting and I will act on it! In the mean time my opinion is that the Village email addresses should only be used by the person to whom they are assigned. I don't know who Laura Mitchell is but I do know that the email address she sent does not belong to her. I also know that if I do send something to Councilman Mitchell I do not want someone named Laura Mitchell to read it! After much consideration I sent the following email to Mayor Ellington. It is self explainatory. I am not sure that Councilman Mitchell's email has not been compromised. If you read below you can understand my caution in asking you to forward this to Councilman Mitchell for me. 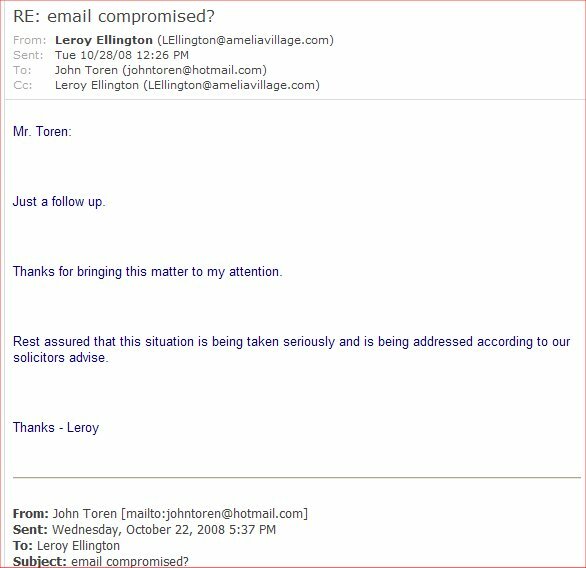 I realize that anyone can get the Village email addresses from the Village website and use them but I believe that communications between residents and Village authorities should be confidential and I did not want to take a chance that Councilman Mitchell's email would be seen by someone else other than yourself. I might point out to you that there are ways to have emails sent to the Village authorities without disclosing the address so this can be prevented in the future with a change to the Village website. 43 year resident of "Old Amelia"
I received an email, see below, from someone using your official village email address. I am curious why this person believes she should be involved, calling unknown people liars, alleging that unknown people harassed the "business owner", informing the "business owner" that she can come and talk to her any time, et al. Was the email writer involved in the incident and if so to what extent? If she wasn't involved then is she speaking for you and the Village? Lastly, if you know this person you may want to warn her about accusing me of having a "HENCHWOMEN". I do not take kindly to people making statements such as "WHO WAS BEING HARASSED BY YOUR HENCHWOMAN". I did not know this "HENCHWOMEN" when the event occurred. The story is floating all over the Village! When I heard it I checked it out with multiple sources. I am trying to get a copy of the Sheriff's report now. Since the email was to me I can only assume that the word "YOUR" meant me. If I were her I would not say this in public! Let me know and I will attempt to retrieve the URL where the email came from and if possible we can find out who used your email address. I know this is possible under certain circumstances. I am not sure that I can do this but I don't want to spend a lot of time and money on it if you know her. WHOEVER YOU GOT THIS INFO FROM IS AN ABSOLUTE LIAR. AND I ASKED THE "BUSINESS OWNER" WHO WAS BEING HARASSED BY YOUR HENCHWOMAN TO INFORM HER THAT SHE CAN COME AND TALK TO ME ANY TIME. I'D BE MORE THAN HAPPY TO TALK TO HER AND HAVE HER EXPLAIN HER COMMITTEE'S STAND TO ME. ANGELO IS AVAILABLE FOR QUESTIONS ANY TIME. THERE IS PUBLIC INPUT AND EVERY COUNCIL MEETING AND HE WOULD LOVE TO SEE YOU THERE. That didn't take long! I received a feedback a little after 11PM and according to the sender Laura Mitchell is Councilman Mitchell's wife. NOW UNDERSTAND THIS - we do not know who sent the email because of the email address being Councilman Mitchell's so please DO NOT assume it was his wife that sent the email. If Councilman Mitchell responds and tells us that his wife did indeed send the email then we can go from there. The sender did bring to light that the Village already had a copy of the petition! This reinforces the opinion that Councilman Mitchell had no righteous purpose in going to the "business" and essentially stealing the petition since he already had access to one that was given to the Village. This is a question that I will be asking the detective in charge of the case when I have an opportunity to talk to him! I received this carbon copy from Mayor Ellington on October 23rd, 2008. 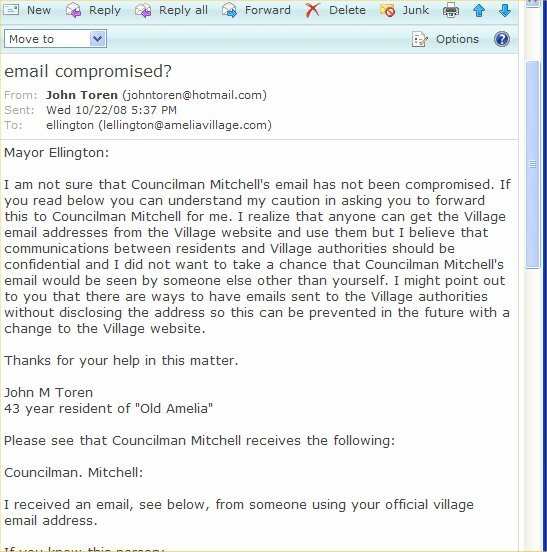 It would appear that Mayor Ellington shares my concern about the use of the Village email addresses. We will just have to wait and see where this goes. I received this email from Mayor Ellington on October 28th, 2008. It would be wise to edit your text in a .txt work file and then copy and paste it into the form text box. You could lose it if you forget to include the required fields or have some sort of blocking software that will not allow you to post to this form.